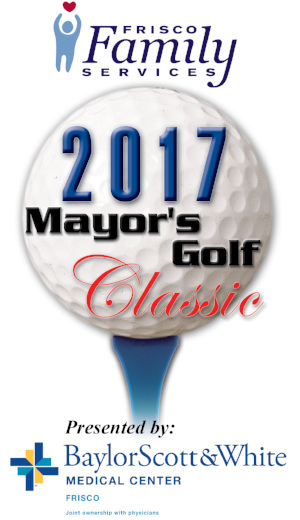 The 15th Annual Mayor’s Golf Classic was held on June 19, 2017, at Stonebriar Country Club in Frisco. We are so excited to announce that we exceeded our fundraising goal! Thank you to Baylor Scott & White Medical Center Frisco who has generously been our Presenting Sponsor for the last 11 years, and to all of our sponsors. Click Here to see all of the 2017 Mayor's Golf Classic Sponsors and Tournament In-Kind Donors. Congratulations to the winners of this year’s tournament! In First Place was the Bannecker Family Operated GNCs team including Matt Bannecker, Scott Bannecker, Tim Bannecker, Jr., and Tim Bannecker, Sr. In Second Place was the PlainsCapital Bank team including Tomasz Kwiatkowski, Todd Beckmann, Jon Kendall, and Zane Benson. Rounding out the winning teams in Third Place was the St. Ive’s Realty, LLC team including Jim Gissler, Bryce Gissler, Scott Henard, and Robert Shelton. Competitions included Longest Drive, Closest to the Pin, a Putting Challenge against Frisco’s Mayor Jeff Cheney, and a chance to win a 2017 Discovery Sport from Land Rover Frisco. Proceeds from the Mayor’s Golf Classic benefit the programs and services that Frisco Family Services provides to more than 3,700 individuals each year, to support our neighbors in crisis living in our Frisco and Frisco ISD communities. Thank you for making this event even bigger and better than last year and for helping Frisco Family Services continue to meet the needs of our growing community.